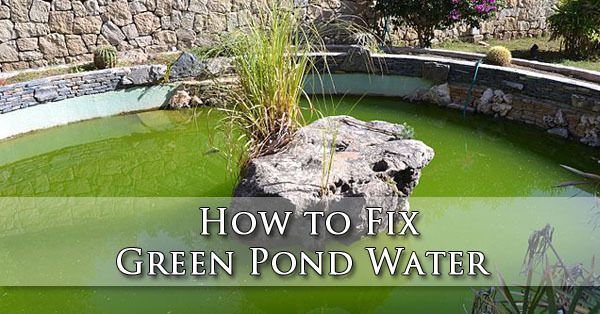 Are you searching for “How to Fix Green Pond Water“? If so this article is for you. We have prepared this guide to help pond owners understand what might be causing the green water, and what they can do to solve it. A single-cell free floating algae is what causes green pond water. It happens to be the most common issues that people have in their pond and it can be hard to deal with. If you follow the directions on the Controlling Algae in the Pond webpage, then you should be able to take care of this situation by making a biologically balanced ecosystem. To find out what plants are best to help you clear your water on the Clear Water Pond Plants webpage. Although, sometimes algae have ways of making a pond cloudy even if all the things to make it clear are met. This could be caused by various things, like heavy fish load, water source, or organic matter in the pond. You can reduce your green by cleaning the debris called detritus from the bottom of the pond with a pond vacuum or long handled net. This is usually done in Spring and then in Fall. There is a new trend that has become quite popular for pond owners, that is owning a pond skimmer with an optional bottom drain. This takes away the need to clean the bottom of your pond because it does it for you by skimming debris and leaves from the pond before it sinks to the bottom. It also makes pump and filter maintenance easier. Another way to reduce organic matter in your pond is to add bacteria like Microbe Lift PL with a sludge reducer. These bacteria help to seed the bio filter and eat the sludge that lands at the bottom of the pond. Having a heavy fish load or a lot of pond fish can cause green pond water because fish waster is being broken down by good bacteria through different steps until it becomes nitrates, which is what eaten by algae and plants. Even if you have a large amount of plants in the pond that are consuming the nitrates, and you still have too many fish, there will be algae. Reducing how many fish you have will help to get back to a natural balance. There are some water sources such as well water or city water that will have high phosphates. Phosphates will contribute to your algae growth being that it is a main nutrient that plants need to be able to grow. There are various brands of phosphate removers on the market, but in a large to medium pond that will be pretty expensive because it needs to be replaced often. If you have tried basically everything and still have a green pond, don’t worry. There are a few more solutions left. There is D-Solv-9. This is an algaecide that will clear your green pond water, but it also removes string algae. This is very concentrated, and just a 16-ounce bottle will treat around 9,600 gallons of water. If you have a really large pond, then they have 1 gallon bottles to treat around 76,800 gallons of water. It normally works with just one treatment, but there may be times where it takes 2-4 treatments. Then you have UV or Ultraviolet light. We have various types of UV Clarifiers that will work for your pond. If everything else fails, then these will work. If you get the right UV light that is matched to your pond size, and you have plenty of water running through it, then within 2 weeks, you will have clear water guaranteed. If you live in the Phoenix valley and want the best products, knowledge, and guidance for having the best water for your pond contact The Backyard Pond. Our pond and Koi experts will help you understand what it takes to have a backyard pond to be proud of. You can stop by our location or give us a call at 623-878-6695. Next Next post: What Do Koi Fish Eat?